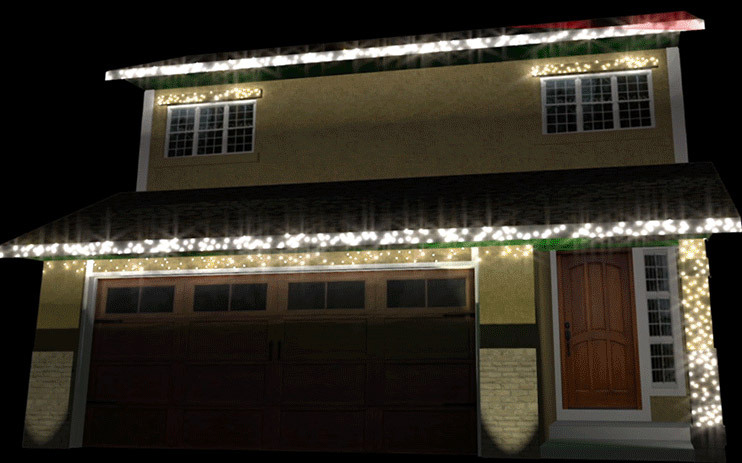 Stauffer & Sons Construction is doing something a little different for Christmas this year: we’re celebrating by sponsoring a Christmas light show here in Colorado Springs… and you are welcome to come see it! Earlier this year, we had spoken with Joe Poch (a friend of ours who runs a production company, Innovative Moments), who mentioned that he wanted to test a new technology called 3D Projection Mapping, which hasn’t really been seen in Colorado Springs before, and thought a Christmas light show would be the best way to do it. Projection mapping is taking a series of animations and photographs and turning them into a presentation that is then projected onto a 3D object, such as a building or house. So we were happy to help pitch in and spread a little Christmas cheer: we decided to sponsor the effort, and also to provide some photos of custom homes that we’ve built in the past. The photos were incorporated into a light show that is projected onto the exterior of a home in the Old Farm neighborhood. In addition to the exterior of our homes, you can also see many other designs in the show, including a gingerbread house, snowflakes, candles, a nativity scene, and more. If you’d like to come see the show, you can do so seven days a week from 6:00pm-10:00pm until Dec 31st, 2013. The best news about a show like this is that you don’t have to get out of your car! An orchestral musical score plays in sync with the light show, all from the comfort of your car if you tune into 106.5 FM. For complete info on the setup, check out the web page here: www.csxmasmagic.com. Or, if you visit the show and like it, check it out on Facebook! At the home where the show is, we’ll be collecting donations to benefit a project that’s dear to our hearts: HBA CARES—the 501 (c)(3) nonprofit affiliated with the Colorado Springs Housing & Building Association—is renovating and improving Mountain Shadows Park as part of the restoration of the neighborhood from the Waldo Canyon fire. We figured this might be a nice way to help contribute and give back to the neighborhood has that lost so much, and that we’ve been fortunate enough to help rebuild. This small show is just a first-year proof of concept, so if it all goes well, we may do something even more elaborate next year. Come check it out, and let us know if you like it!